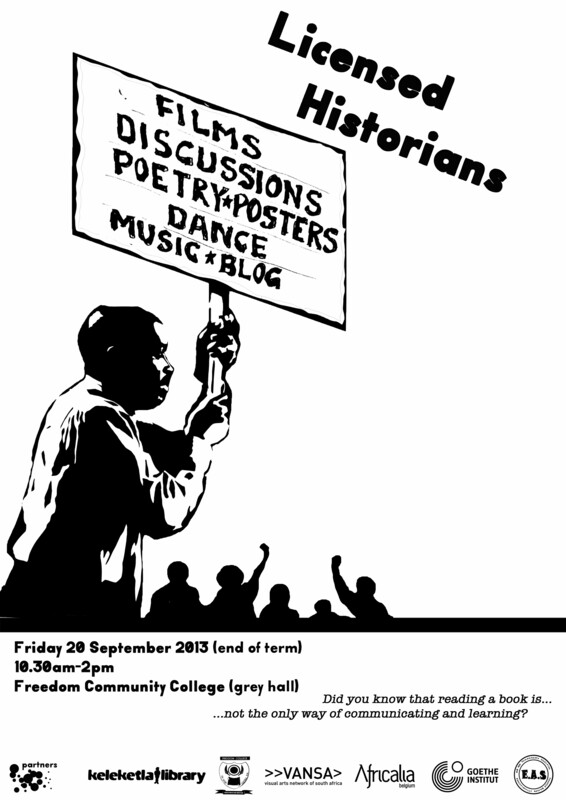 ‘Licensed Historians’ is a Keleketla! After School Programme platform for public engagement with work produced with Freedom Community College and Keleketla! Library members. The event takes the form of a screening, a lecture, discussions and performances. Freedom Community College Library committee will be introducing a ‘digital identities’ project within the school, launching with a blog. The event is a curation/collection of questions and answers developed with learners to explore how libraries are not only spaces/platforms for books on shelves, but also for preserving and activating cultural heritage. The event suggests other forms of practical and intellectual sources of knowledge beyond books. Keleketla Librarian Lot Kafesu will give a lecture on the use of libraries as centres for preservation of cultural heritage. The lecture hopes to create a broader and deeper understanding of heritage. This event is produced by Day Mthembu as part of the VANSA/Africalia internship programme. The event is realized in partnership with Freedom Community College library committee and Educationally Active Students (EAS) from Basa Tutorial Institute.